Tigon Martial Arts began as a childhood dream. Owner and chief instructor, Thomas Brown, started martial arts at a young age. Very early on in his training, he become passionate and determined to open his own martial arts school. At age 19, that dream started to become a reality. In the fall of 2005, with the help of his then instructor, Thomas DeVine, he began a program at Kid Sports and Kinetics Adult Fitness in Hadley, MA. In the Summer of 2006, Sensei Brown decided to start his own independent business, still offering classes at Kid Sports and now also establishing programs at The Fitness Studio in Belchertown, MA as well as Dance Unlimited in Ware, MA. While those programs achieved a modest amount of success, in the Spring of 2007, both Kid Sports and The Fitness Studio closed rather suddenly. Unable to find additional gyms in the area to offer programs out of, Sensei Brown decided to relocate the school to its present location in Belchertown, MA. The new dojo opened in the Fall of 2007 with only 20 students. Since then, the school has gone through many renovations to accommodate its continually growing student population and has maintained an active enrollment of over 100 students for several years. Our system of White Crane Kempo Karate, which is an A.M.A.A. certified hybrid martial arts program, offers a well-balanced multidisciplined approach to training. The art of kempo serves as the backbone of our system. More specifically, the techniques of Shaolin Kempo Karate and American Kenpo Karate have been integrated together in such a way to provide a comprehensive look at the principles that govern motion in combat. The art of Shaolin White Crane Kung-Fu, while containing many of its own unique fighting strategies, has a more classical approach to training focusing on patterns of movement rather than self-defense techniques. These white crane patterns offer a more subtle and internal approach to generating power, teaching students how to transmit power through the shaking of the hips as well as the whipping of the spine. Our method of instruction is one in which these multiple art forms have been married together. This is all done in a way that provides a systematic approach to training, from which the various skills may be developed and individual style may emerge. 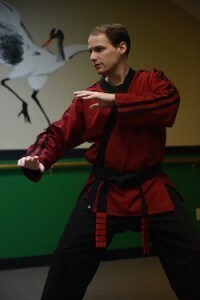 Tom has been a student of the martial arts for more than 20 years, and has been teaching for 18 of those years. He was promoted to 6th Degree Black Belt in Kempo Karate by Shaolin American Kempo Grandmaster, Jim Brassard. He also has extensive knowledge in Shaolin White Crane Kung-Fu, which has no ranking structure. He has been certified as a 5th Degree Black Belt in hybrid martial arts and awarded the title of Master Instructor through the American Martial Arts Association (A.M.A.A.). The system he teaches is an A.M.A.A. certified hybrid martial arts program. Tom is a Lifetime Member of both the American Martial Arts Association (A.M.A.A.) and the USA Martial Arts Alliance. Robert (Moses) is a 4th degree black belt. 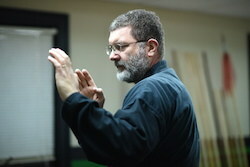 He is a Certified Instructor with 25 years of Martial Arts study and 19 years of instructional experience. He has been of member of Tigon Martial Arts since its opening, and continues to play a pivotal role in the school’s success. 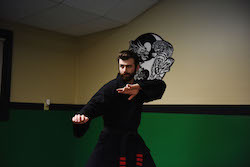 Adam has been a student of the martial arts for 21 years, is a 4th degree black belt and a certified instructor who also runs his own dojo in Enfield Connecticut. He is a United States Marine Corps Veteran who has received commendations for his service.